In 12-inch nonstick skillet, heat oil over medium heat. Cook ham steak in oil 6 to 8 minutes, turning once, until browned and hot. Remove steak to deep serving platter; cover to keep warm. In same skillet, cook bell pepper and onion over medium heat 2 to 4 minutes, stirring frequently, until crisp-tender. Stir in beans and barbecue sauce. Heat until bubbly. 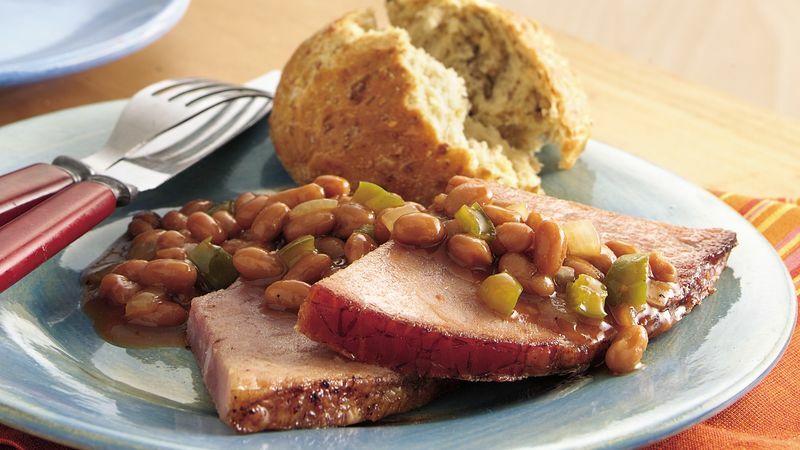 Pour beans over ham. Corn muffins from the bakery and deli coleslaw make this already quick meal even easier to put on the table.